Time-correctly listening is said to be of great significance. In the “Camper 112”, for example, a broadband loudspeaker operates. This does not cover the entire human listening area, but the sound comes from just one point, which is perceived as very natural to the ear. If you wish to use the complete human listening range, you must switch to a 2-way system (eg BlueAmps “212 FR-A”). There is a bass-midrange speaker for basses and mids and a tweeter for the treble. 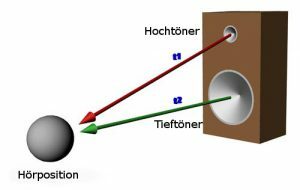 In a conventional 2-way box, the sound is produced in two different locations. Depending on the listening position, the sound of the bass and treble range will take different times due to this distance. Basses and trebles therefore do not occur simultaneously in the ear. Many people do not hear the difference to just one sound source, but some perceive the acoustic perception as unnatural. To avoid this problem, you could use coax speakers. Coaxial speakers are also multi-path systems. However, tweeters and bass speakers do not sit side by side, but behind each other. For the ear it sounds as if the sound comes from only one source, and thus more natural. 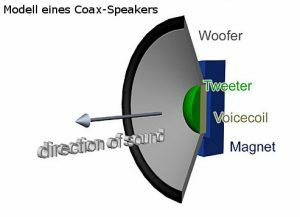 A coax speaker comes e.g. in the “Camper CX”. Coax? Or rather not? – What’s the hype about? If you want to play small and medium-sized stages or productions in mono, a coax in 12 inches is just right. For larger requirements or stereo signal, a coax drops out. .. Why? For stereo applications or larger (e.g., 2×12″) amps you need multiple speakers. The heights radiate quite wide (80-100 degrees) on a coax chassis. If one chassis next to each other, the radiation ranges of the speakers, which in the upper mids and highs sounds very unattractive. Coax speakers are therefore not stackable. By the way, I’m not alone. Also speaker guru Jay Mitchell from the USA represents this opinion. And because I personally always play stereo (BlueAmps “Spark Full Stack”), FOR ME a coax speaker is unfortunately not an option.